As I've already posted we don't celebrate halloween but instead we have a 'light party'. One of our favourite light games is playing with glow sticks in a loose parts kind of way (I don't let The Frog play with them yet as I don't like the idea of him chewing them). I'm rather fond of pumpkins (I think its partly their colour - I love autumnal colours). We don't celebrate halloween as a family, so we don't have a traditional 'jack 'o' lantern . However we often have a light party at our church - an alternative to halloween without all the witches and ghosts, but with lots of fun and games based on light. So I thought, why not have an alternative lantern. 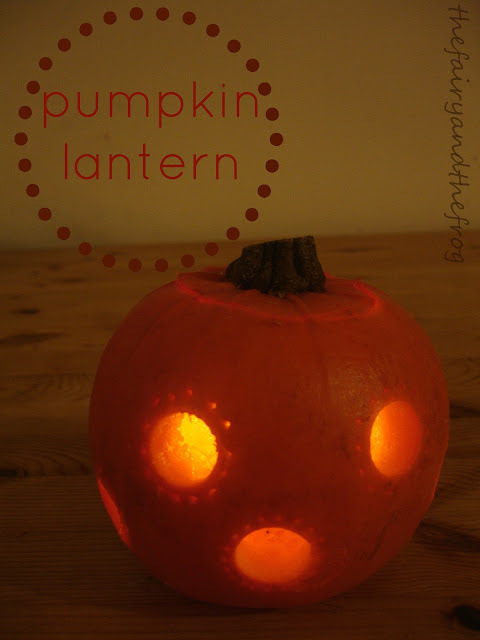 Here's this years lantern, partly inspired by this really cool Montessori style pumpkin by Taming the Goblin. I had originally planned to do a floral design but my patience (and the size of the pumpkin) meant I went for something more stylized. I used an apple corer to make the big holes and a kebab stick to do the smaller ones. It was great for talking about shapes (circles) with 'The Fairy'. The finished lantern. 'The Frog' was fascinated by the light and kept pointing at it. It would make a great centre piece for a harvest festival or bonfire party. Please remember not to leave any naked flames unattended as they pose a fire risk. Now we have a cupful of pumpkin seeds to do something with.... what do you do with pumpkin seeds? I adore conkers, I love how they feel and how shiny they are when they first pop out of their case. So when we were in the park the other weekend I picked some up and put them in my pocket. The Fairy loves to play with them too. I do get a bit nervous about The Frog playing with them as they are 'choking size'. 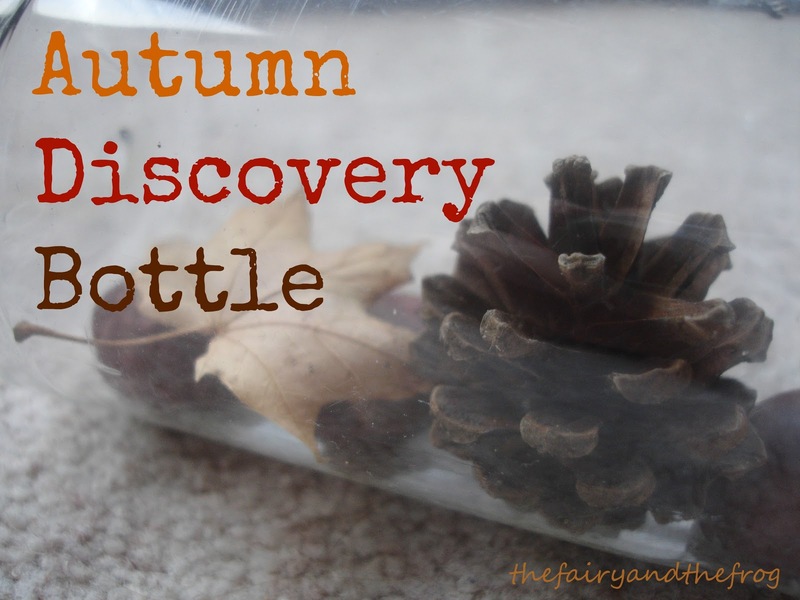 As I was thinking about how he could play with them when I remember his love of discovery bottles- an Autumn (or Fall) bottle seemed a perfect solution. If you've not come across these before they are basically bottles with things in to discover! Older children can observe it and predict, younger ones can use it in a similar way to a rattle (or eat it). You can put anything that takes your fancy in them, the first one I eve made was for the Fairy when she was little (10 months)- its got glitter and coloured water in and still gets used today (and she's 4!). 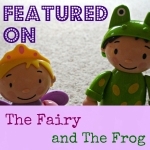 The Frog has one he adores with plastic beads (think he likes to make noise to compete with his big sis' chatting). I seal the top with a hot glue gun just to make sure it isn't going to get opened (I also make sure they are not played with unsupervised just in case they do). To our base of conkers I added a small leaf, a fir cone and a cork (I know that's not strictly autumnal but it's a good colour and we had it in the kitchen). 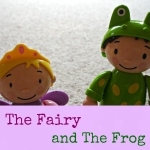 As you can see from the photos The Frog loves waving it around. The Fairy likes to borrow it too. 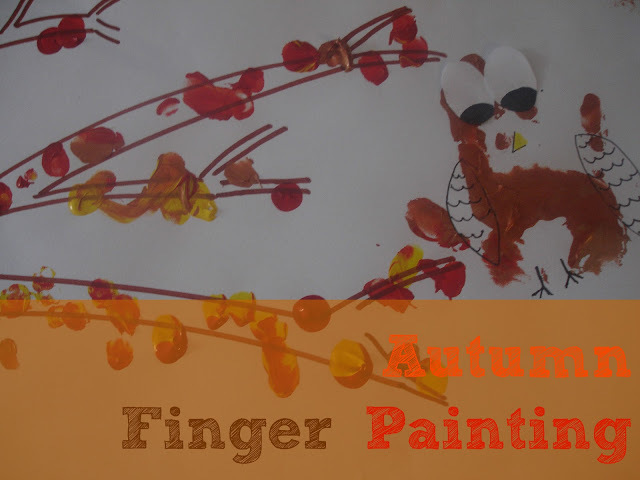 On the way home from pre school, The Fairy asked 'Can we paint something with autumn leaves on Mummy?' My first thought was to do some leaf printing, but we've had so much rain the leaves here are soggy, sludgy heaps not crisp, crunchy, printable leaves. Mixing paint. 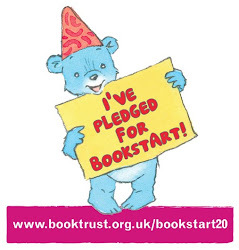 We used poster paint (here's an affiliate link in blue to some paint just in case you want to buy some more - if you choose to buy the paint we get a small commission at no extra cost to you).